Description: Competed against 700+ other professional and aspiring copywriters of varying skill levels. The challenge was to write an online email ad of just 83 words to “sell” a new fitness tracker and lead the reader to click the "More Info" button to the main selling page. Read full details at AWAI here, my winning entry is located at the bottom. 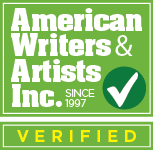 Tested and Verified by top copywriters as knowledgeable in the best current copywriting practices. 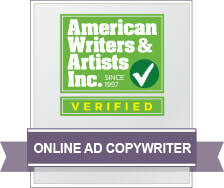 Trained in the current techniques of A-List Online Ad Copywriters, then passed a written and practical exam scored by professionals. Click the file on the right to view my revision-stage exam ​critique (Perfect score!) and Samples of each kind of ad. Description: November 2017, Created a flyer to announce the new Produce on Wheels Without Waste (Powwow) location in Scottsdale, Az, and I marketed the event via occasional Facebook posts and distributing flyers to three local community centers. Results: First day the experts expected turnout was about 50 contributors and we had nearly 2x that with 90+ contributors with more still showing up after closing time! Then a growth of 15 to 40+ new signees every monthly event thereafter. Current contributors excitedly await new season in October.